"This ceremony was an important way for Emory Saint Joseph's to recognize the staff who have contributed so much of their time and effort. We exceeded our goal of $25,000, and what our employees have accomplished through their fundraising efforts has been phenomenal," says Jeanne Landry, vice president of human resources at Emory Saint Joseph's. 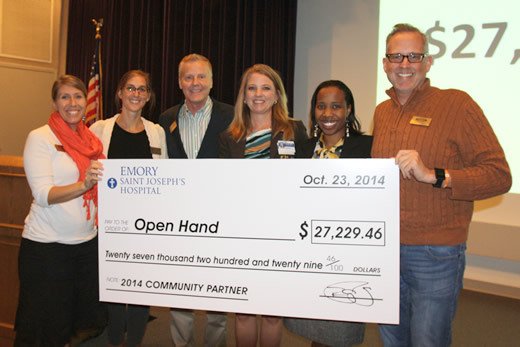 Emory Saint Joseph's Hospital employees demonstrated their generous spirit of fundraising and making a difference for those in need by presenting a check for more than $27,000 to Open Hand, the hospital's 2014 community partner. For the second year in a row, Emory Saint Joseph's partnered with an organization in the community to serve those less fortunate. Last year's community partner, the Gateway Center, was the recipient of the hospital's donation of more than $22,000, benefiting Atlanta's homeless. "We were eager to partner with Open Hand, because this organization provides a service that supports Emory Saint Joseph's mission, caring for the poor and vulnerable," says Jeanne Landry, vice president of human resources at Emory Saint Joseph's. Founded in 1988, Open Hand prepares and delivers medically appropriate meals seven days a week, 365 days a year to clients in an 18-county region. In fact, approximately 14,000 volunteers deliver these meals to clients and their dependents living with chronic or terminal illnesses or disabilities. These meals are often the primary source of nutrition for various ages, ranging from at-risk youth to seniors. Since March, Emory Saint Joseph's employees held a variety of creative fundraisers including: bake sales, a weight loss challenge, plant sales, raffle tickets for a quilt and a television, fudge sales, a cookout, and dunking booths at the hospital's Farmers Market. In addition to staff teams supporting Open Hand, physicians, patients, visitors and the community rallied to support the hospital's fundraising efforts. One such event was a Community Health Screening sponsored by Oncology Services. Attendees paid a registration fee to attend the preventative cancer and cardiovascular screenings with all proceeds donated in full to Open Hand. During the check presentation to Open Hand representatives, Emory Saint Joseph's administration also recognized the many dedicated hospital departments and employees for their significant fundraising efforts. "This ceremony was an important way for Emory Saint Joseph's to recognize the staff who have contributed so much of their time and effort. We exceeded our goal of $25,000, and what our employees have accomplished through their fundraising efforts has been phenomenal," says Landry.